I love autumn…more than any other time of the year! I love the cooler temperatures, after the sticky, icky heat of the summer. I love the colours of the leaves. I love autumn produce…pumpkins, butternut squashes, apples for homemade applesauce and crisps. Autumn makes me feel like hunkering down at home, cooking and baking, knitting and spinning. So I guess that’s convenient for me, since I have realized my list of Christmas gift knitting is growing, instead of shrinking. I haven’t done much baking yet, but I spent a good portion of last week looking for a good recipe for pumpkin cake. And there is a squash risotto recipe that is calling my name that I have not made since 35 degree days started making risotto completely out of the question. No way I am standing over the stove in that heat for an hour. But I digress! I have been thinking of expanding this blog to include some other things beside fibre-related posts, partly because I am an avid cook (and slightly less avid baker) and partly because I chose to resurrect this blog at a time when I am mostly knitting one of two things: Sooper Sekrit test knits and Christmas presents (also Sooper Sekrit!). Having a dearth of FOs that I can photograph is a problem, and inspired by Anne Hanson of Knitspot fame, whose most recent blog posts have made me gasp with all the pretty, I decided that I will be expanding my subject matter a bit. I am also planning to try my hand at spinning on a wheel this fall. 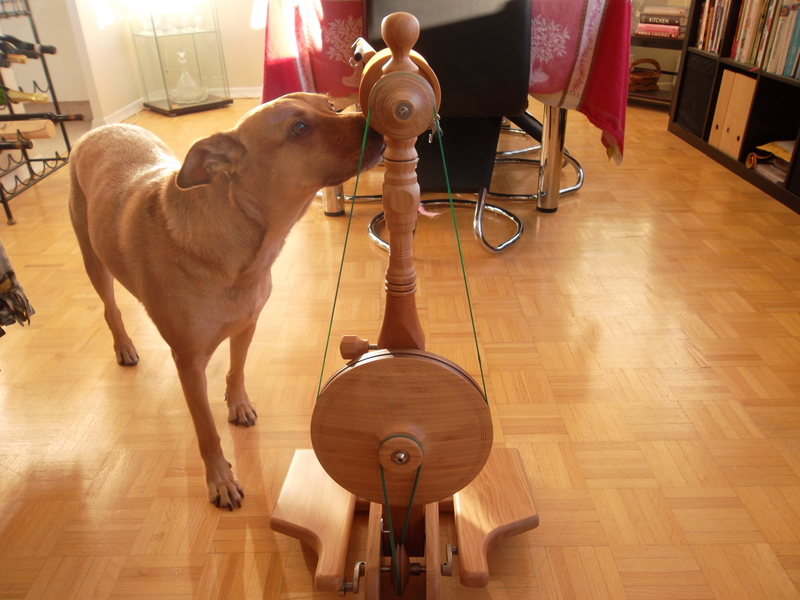 I learned on a spindle in the spring and decided to look for a wheel for Christmas as a gift from my family. In the meantime, my friend Jacqueline offered me the use of her Majacraft Little Gem…isn’t she pretty? Kayleigh is fascinated by all things fibre related, including this wheel! 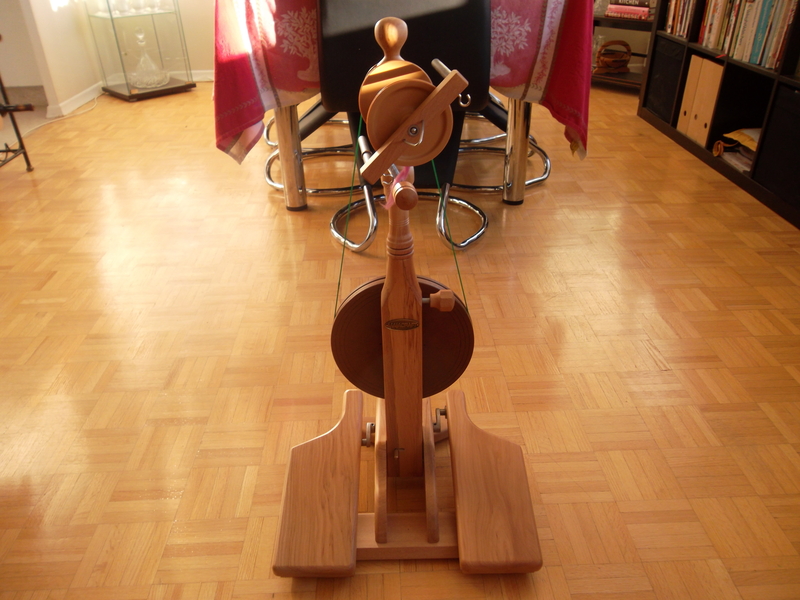 I plan to use this wheel to try and get the rhythm of treadling and such. Drafting needs to go a LOT faster when a wheel is involved! In anticipation of getting a wheel for Christmas, I have also been acquiring a mad amount of fibre, mostly though destashes. However, these came in the mail yesterday…two sets were from a swap on a Ravelry swap board and the other two were ones I purchased from the swapper, as these are her own creations. The artisan goes under the name FiberQuirks and these batts are based on the 22 Major Arcana of the Tarot. 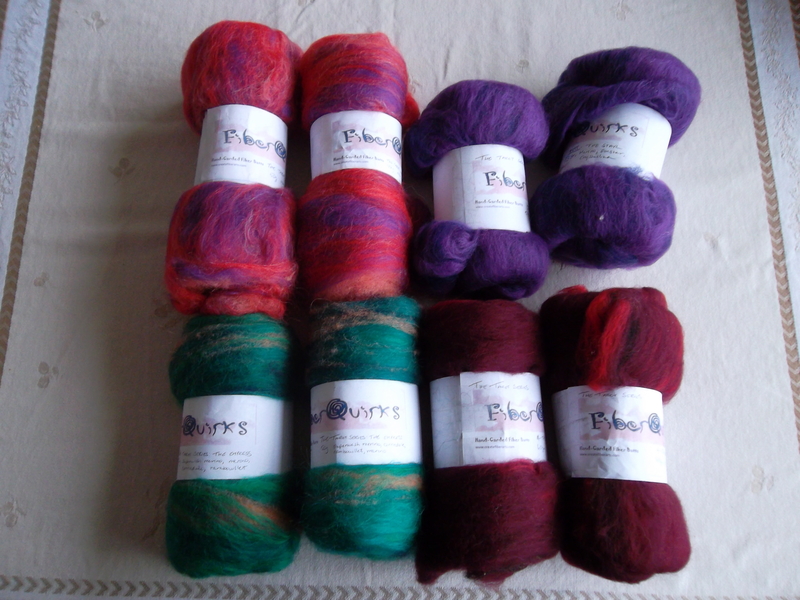 Each one is a different colourway and fibre blend. Aren’t the colours just spectacular?? I can’t wait to get good enough to spin these up! My autumn seems to be getting busier and busier! This entry was posted in Uncategorized and tagged fibre by Rayna. Bookmark the permalink.